The Neato robotic vacuum gets to work via an app or Amazon's Alexa. And pets love to watch it. If cleaning the house is not something you look forward to, you’re not alone. Vacuuming and mopping the floors and cleaning up after pets are chores not many people look forward to. But now, thanks to new technology, if you can lift a smartphone, you don't need to lift a finger to keep your house pristine. Here are five must-have cleaning gadgets that will help keep your house cleaner, with minimal effort from you. The fastest, easiest way to clean your house without lifting a finger is with a robotic vacuum. With a connected vacuum like the Neato Botvac D5, the only time you’ll need to actually touch the vacuum is to empty the dust bin. You can control this vacuum from your phone using the Neato app or, if you have an Amazon Echo, you can ask Alexa to start the vacuum. The app makes it easy to set a schedule so the vacuum cleans the house and returns to its charging base when you’re not home. 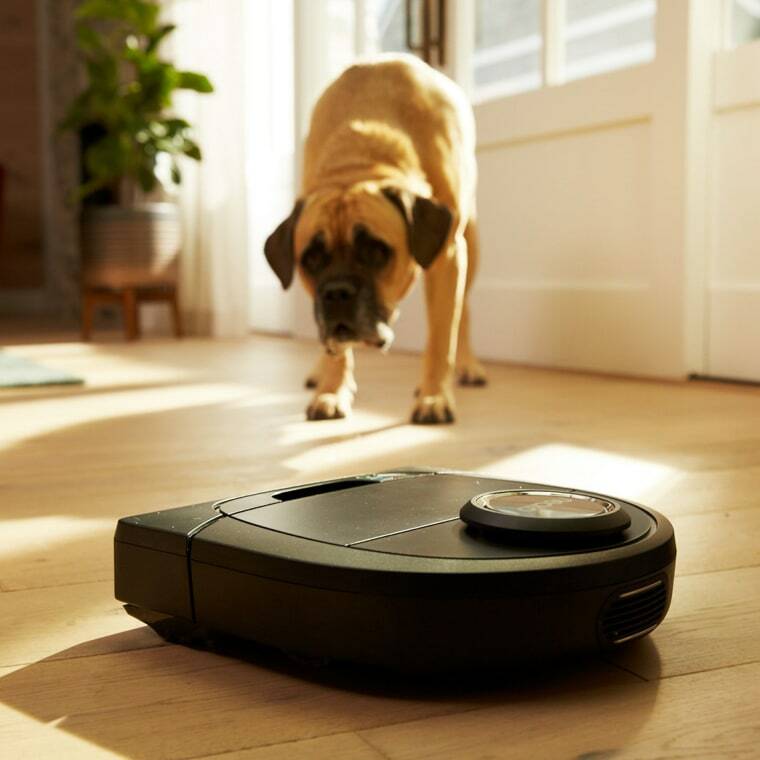 If you prefer to watch it do its magic — or watch your pet watch it, which is always fun — the app lets you start and stop the vacuum and sends a notification when the job is done. The D5 comes with laser navigation so it knows where it’s been and where it needs to go, and returns to the base to recharge if the battery runs low, then resumes the job. It has a low footprint so it can get under the couch, and a unique D-shape design that lets it get into corners where all that pet fur accumulates. If you have hard wood floors, put the iRobot Braava jet Mopping Robot to work and you’ll never wring out a mop again. Attach a coded cleaning pad to the bottom of the robot and press a button to start. The robot knows whether you want wet mopping, damp sweeping or just a dry sweeping up of dinner crumbs and cat hair. Built-in software helps it methodically make its way across your floors, mopping and sweeping under the couch, around the toilet, and all those other hard-to-reach places. The only thing you have to do is throw away the cleaning pad when it’s done. Sifting and cleaning the cat litter is truly one of those thankless jobs. It’s smelly, you usually get cat litter all over, and you just have to do it all again the next day. If you can stand having something that looks like a pint-sized alien spaceship in your bathroom or basement, the Litter Robot gets the job done. It’s larger than your average litter box and it costs a whole lot more, but this litter box cleans itself every time your cat uses it — so you don’t have to. After your cat is safely out of the litter box, a sifting process sends the waste and clumpy litter to a drawer in the bottom keeping your hands and your bathroom clean and odor free. Empty the drawer once a week and you never have to scoop litter again. After your cat is safely out of the pod, this bot starts sifting waste and clumpy litter, keeping your hands and bathroom odor free. If squeegees and ladders aren’t your thing, check out the Winbot 950 Window Cleaning robot from Ecovacs. It’s like a Spiderman-enabled robotic vacuum for your windows. It attaches by suction to a pane of glass, whether it’s framed or frameless, and moves around on rubber tank treads, squeegee-ing and wiping as it goes. Edge sensors in the corners of the square-shaped robot help it get into hard-to-clean corners. It has a remote control so you can start, stop, even change direction from the comfort of your chair. No worries about it running out of battery and falling off; it has a back-up battery, a safety pod and tether. That’s a whole lot safer than you on top of an extension ladder. The Winbot 950 robot from Ecovacs is like Spiderman for your window cleaning. Keep your home smelling fresh and crisp without doing a thorough cleaning or spraying air freshener all over. Ellia Aspire Ultrasonic Aroma Diffuser by HoMedics has a smartphone app so you can control it right from your phone. Add calming essential oils into the water in the glass bowl and sit back and relax as it sends a fine mist through the air. The diffuser has a few party tricks, including a color-changing light and a variety of soothing and relaxing sounds to choose from. Use the app or the included remote to start and control the mist, or change the color and soothing sounds to match your mood. Relax and breathe.